The weather in Rochester has been pretty damp lately. Because of such, there has been a drastic increase in the number of worms that are appearing on the driveway. Cardin has developed a phobia of the worms and when she see’s one on the driveway she shouts, bull horn style, “EWWW…WORM MOMMA”. I can’t quite get her to understand the concept that she can easily just step over or around the worm and avoid them altogether. We’ve had a couple of nice afternoons weather wise and my mom took her out one day to play for a few minutes. 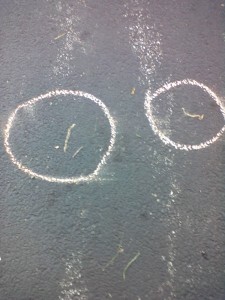 Cardin proceeded to get out the chalk and walk to each worm on the driveway and place a circle around it. As though she was marking out a minefield. I’m not really sure the purpose of this mission. Perhaps it was just for greater visibility to places she should not walk. Perhaps she feels it is some sort of magic circle that, once the worm is enclosed in, will repel the foul creature from further malicious activity that threatens her feet. Either way, I’m certain her disgust will prevent her from being that kid that picks up the worm and swallows it.